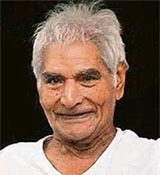 Baba Amte needs no introduction to the socially conscious Indian. Here is a rare interview with Baba reflecting on a lifetime of social service and love. An edited transcript of the interview which was conducted by Rajeev Mehrotra of Doordarshan. Rajeev Mehrotra (R.M. ):Despite physical infirmity that prevents you from sitting because of the problem with the base of your spine, you have really, in a sense,transcended the body and the limitations of the human form with the enormous energy and enthusiasm that you are able to generate in so many people and the enormous self confidence that you are able to inspire in them. What is the philosophy that has given you this altruistic thrust? Baba: I always accept my illness with faith and peace of soul. I always remember Him for what is left rather than curse him for what is lost. That is why I could live for four decades with physically handicapped people and children of darkness at Anandwan. R.M. : The main philosophy that you have perpetuated, while your activities at Anandwan have extended many folds beyond, has really been that ‘It is charity that destroys and it is work that builds’. Where did this idea come from? Where was it born? How did it germinate? Baba: I have seen people becoming welfare addicts in this world; healthy people, and I was confronted with the deformity of the leprosy patients with no thumb left, no toes left and no fingers left. They couldn't even show where it aches; where it hurts. I was confronted with blind boys who couldn't see the mountain; who couldn't see a pinch of salt in their plate. Their eyes were never caressed by the rays of light even once in their lifetime. I was confronted by deaf and mute children. When legendary musicians Vasantrao Deshpande and Kumar Gandharva came to Anandwan, they were sitting with a vacant look. I realized that on the stage of life, though they were present, they were totally absent in this world. I said to them that until now starting right from the birth of the globe, leprosy patients in this world were walking all alone. In Anandwan, they decided to walk together and then I wrote this slogan, Charity destroys, Work builds and you can see in this small world, though it is a world within a world, or a world without a world, that they produce everything except salt, sugar and kerosene. It’s a mighty faith worthy of miracles. R.M. : The overwhelming feeling that one gets here in Anandwan is the enormous sense of optimism, of self-sufficiency. Its almost as if people who have a handicap have forgotten that they have a handicap; they have transcended it. Baba: Unless you are inspired, you can’t inspire others. Unless you are moved, you can’t move others. Unless you are motivated,you can’t motivate others. When I pronounced the diagnosis of leprosy, they hated to live. Now they love life. If you go to our cooperative store, you will find things like powder and nail polish. This shows that they have fallen in love with life. R.M. : The other dimension that strikes one here is that there hasn't been an attempt from you to impose your philosophy, your practice of diet, your cloth or anything like that. Your community has encouraged people to be themselves. Baba: In social service, you can’t dictate things. A social worker is he who understands the needs before they are born in others. His is a work of persuasion, perseverance. Patience is our reward. R.M. : You mentioned that you can only inspire if you have inspired yourself. I think many of us experience our frailty and weaknesses when we are moved by the suffering that we see and we seem to be grasping for this whirl spring of inspiration. Where does it come from? Baba: Before they use it [inspiration],they want to do something. It’s like twilight. Figure is noticeable, but not recognizable. When they are exposed to different adventures, frontiers and fields of service, they can pin down whose silhouette it is and then decide to do something in life. R.M. : So, where does this whirl-spring lie outside the umbrella or the reach of Baba Amte? Baba: If the disabled sector, these outcast people on an outcast land, if they could create an Anandwan about which I am with great pride, the joy in Anandwan is much more infectious than the diseases in Anandwan. I say to the youth that they happen to be leprosy patients. If there is determination, devotion, dedication; If there is willingness to listen to the promptings of your conscience, Anandwan experiment can be multiplied everywhere in this world. R.M. : You have the faith in people’s conscience. Baba: I have mighty faith in people’s conscience. Gandhiji aptly said, “I don’t believe in class war. The war is going on within me and you. It’s an eternal struggle between need and greed”. If need has an upper hand over greed, social service can take good shape. R.M. : What is the role of leaders such as Gandhi, Vinoba Bhave and what inspiration you have drawn from these two? Baba: I think a leader is he who leads himself; who believes that courage alone can give him power to listen to these shouts of tramps. He doesn't bother what others say. Courage, dedication, simplicity are the things which help a leader to get followers. In my case, I am the captain of a team. I am not a leader. I am the first among the equals at Anandwan. They were inspired. They started doing work. There is no bell here. You must have seen how the work goes on clockwise. R.M. : It’s almost as if initiative such as this is a kind of oasis of hope in a vast ocean of despair and poverty that is India. Do you feel optimistic about the future of India? Baba: I feel very optimistic about the future of India. R.M. : What is that source to you? Baba: Because in this very India, those who were dubbed ‘most unwanted,most unclean’; they could create a forest of bliss on this earth with co-operation, with love,with understanding. They shaped their purpose. They gave a definite direction to their life and they rationalized their part. In this country, everybody talks about the purpose, aim and goal. Everybody talks about the direction, Gandhiji gave this thing, Marx said this thing. Leaders have shown us the direction. They don’t rationalize their part. I hope the citizens of this country rationalize their own part now. Time has come. How to awaken this awareness? Our leaders have miserably failed in awakening this awareness. They are in a hurry. Power always corrupts, corrupts absolutely. Service gives the power which rules over the head, heart and hand of man. R.M. : We've talked about leadership and you have described yourself as the captain of the team. What kind of future do you see for this movement which you've initiated? Baba: You have seen my sons, my daughters-in-law, their colleagues, and their friends who have joined, scuttling their career, far from the madding crowd. They are serving in the Madia gonds tribal projects. So I don’t feel discouraged. I am very much worried because of the disintegrating forces in this country. I want to add grace to the descent of my life. Even in my sunset years, I am out to catch the rising sun. R.M. : What is it that we as individuals can do? Baba: We must stop this balkanization of our conscience which is taking place in this country. R.M. : Could you elaborate “balkanization of our conscience”? Baba: When I went to south during my first march Bharat Jodo( Knit India) march, I had a badge in which Bharat Jodo was written in Hindi and people from Tamil Nadu and Kerala protested, “You've written in Hindi. Please remove this.” I had written in two languages, “Knit India. Bharat Jodo.” When I go to Tamil Nadu, I will write in tamil. When I go to Kerala, it will be written in malayalam. When I go to Andhra, in telugu. When I go to Maharashtra, it will be written in marathi. When I go to Karnataka, “Jodesi Jodesi Bharata Jodesi”. And I was given a roaring reception. We cannot foist our ideologies upon them. R.M. : In your work with the tribes, has it ever come up to you,the dilemma of civilization; of progress, is it inevitably a positive thing? In your articles and speeches, you've talked about their innocence;their values which have been close to nature. Baba: I think we are committing cultural ethnocide in this country in the name of development. It’s not only destruction of culture, but also of life itself. I’m a man in search of man. I was never in search of God because I am doing his work . I don’t bother about his search. For instance, let’s take the construction of big dams. People call us environmental communists, fundamentalists. These are symbols of destruction because not only do they destroy indigenous tribes’ right to property, they pose a great danger to life itself. Whose development? I believe development means liberation. Instead of liberating the people in this country, we have created a craze for expectation. We have not fulfilled those expectations,hence the unrest.Development must liberate a man. He must find out what is good for him;what is bad for him. This was Gandhi’s concern as well. We have confused the whole thing because we have become slave to this media. Our eyes and our ears are hypothecated with this medium of television. We've never inspired,motivated the common man to undertake a uncommon determination to change his destiny. Common man with uncommon determination can change his destiny. I am convinced. I have seen it here [Anandwan], I have seen certain Gandhian projects which have attempted to change this picture of this country. When people are talking about The One-Straw Revolution, we are talking about energy consuming ideas because of the over productive technology. Gandhiji believed in performance of work and not performance of labour and over productive technology makes a man a slave. Demands are created and man becomes a crippled child or a helpless being. The balance use of power, energy, coal can be shared. We are not sharing our comforts with the tribes or the downtrodden or those who are backward. R.M. : Where does the impetus for change come from? There is such a broad set of dissatisfaction with large sections of the community. For decades it hasn't really substantially emerged other than from the pockets and people like you. It hasn't been broad based. Where does this hope and future lie? Baba: The future lies in leadership. The leadership must believe in the people. R.M. : But if it doesn't? R.M. : But do we wait for another Gandhi? Baba: I don’t say that. Gandhi and his technique has become more relevant in this world today then he was during our times. We shouldn't wait. Gandhi’s strength was people. So we go to the people. We never took people in confidence. Once in five years, we have an eye on the voters bank. Some people believe that ballot can be snatched and bullets can work. Others believe that this progress towards 21st century will help the country. It’s not going to help the country. We must share each others’ joys and sorrows. We are sharing the joys of development but ignoring those who are suffering from it. We need not wait for Gandhi. Every national problem has a national solution. Full effort is full victory. My complaint is that we have not undertaken full effort to galvanize the whole nation. R.M. : Would it be fair to say that instead of holding the leadership and government responsible, we as a community have failed to catalyze the change. Baba: I entirely agree. When you talked about do you wait for Gandhi, you were right, we don’t wait for the leaders. For men like me, whenever He shows my way with his tiny little finger, I believe that He will clear my path with his mighty palm. That mighty palm is the palm of the people. R.M. : You've said that you are a man in search of a man and frequently in your writings and speeches you do refer to He or Him. How is that He or Him manifest for you? What does that mean to you? Baba: He who helps me to listen to the promptings of my conscience. Otherwise, our conscience is suffocated in this world where there is a great pollution of honesty itself.When the mass itself has become a man, it is very difficult to listen to those promptings of this conscience. That’s what I pray. You will be surprised by the anonymous soldiers prayer which I say daily. I didn't get anything which I asked for, I got everything which I hoped for. Now, at the age of 74, I ask not to know, I ask not to see…I ask to be used in His world before I walk in this silent company of nature and God. That gives me mighty faith. The faith which a scientist has in his hypotheses is not a blind faith. R.M. :Have you ever been troubled by conscience? Baba: Many times. 'How disturbed the conscience is’ is a constant endeavor in man. Mine is not pursuit of wealth. Mine is a pursuit of happiness, the world knows,continuous creative activities is happiness. My work for nearly five decades in social field has helped me to understand that love alone can resurrect any man in agony. Like Krishnaji I say, intense passion for love is compassion. Man must have conviction. He must have compassion. He must have vision. He must have passion. If these four things are there,you don’t bother whether you succeed or you fail. You are condemn to succeed. R.M. : Why do you say ‘condemned to succeed’? In the traditional sense of the jargon, we would see that as a contradiction. Baba: Because in the end, man realizes his achievements, his successes is an empty boast. So I said one is condemn to succeed. R.M. : What is the motive for him to succeed? Baba: Fulfillment. Fulfillment through life. In this world, it is very easy to die for your country but it is extremely difficult to live for your country. I am trying to motivate the students, the youths and my patients how to live for your country. It’s extremely easy to die for your principle, “Mazhab khatre mein”( My religious ideology is in danger) as the legend goes, and you see the crusades and the tragedy which takes place. It is extremely difficult to live according to those principles. In such country spurious spiritualism is generated. Religion ought to teach us righteousness. But it has taught us rites, quarrel and fight over ‘them’. R.M. : Do you believe in karma? Because it can almost be an convenient, western inspired glib explanation of our predicament; a justification of our passivity, of not responding to the suffering in the manner that you have responded. Do you believe in this? Baba: I believe that His work is His worship. Such a simple thing. When I read The Bible, in one of my poems I said that I cannot carry the mighty load of His cross, but can I not attempt to work in the shadow of the cross and become His contemporary?. The same can be said about Gandhi. On the left side to his ribs was attached a badge of suffering, which is always attached to our ribs. But on this side [right],there was another badge, which I saw,of staunch confidence. R.M. : Where will it come from? Baba: It comes when you are able to experience the sadness personally. When you live with the people who are lonely and have lost their love of life, you get that staunch confidence which is more contagious than leprosy. Had I only preached about leprosy or any other disease without staying here or writing articles about it, I wouldn't have changed the profile of this project. I moved in the country and found out that this is a very easy task. The enemy is visible; tiny little lepra bacilli “acid-fast”. It was very easy for Gandhiji to fight the battle because the enemy was visible. Britishers were there. That’s why for so many years we were splitting India. Knitting India is very difficult because the enemy is invisible. It is within me and you. To fight that invisible enemy is a difficult task which requires immense patience, solid determination, dedication, devotion. As I moved in this country, I found out that people also agreed with me.Today’s youth feels that they are helpless. They don’t want to be silent spectator of this whole episode. But they lack co-operation. They lack confidence. So when I told them you have seen the masses staying in the slums, you have seen obscene poverty. You have seen big temples and churches. God is not only concerned with the soul of man. God is equally concerned with the hunger of the man, with his total ignorance. If people in this country remain silent and nobody goes to them, nobody stirs their conscience, nobody motivates them, then it will be a silenced majority at work, which is the most dangerous. R.M. : You have so often transcended the body in your life and we started our talking about that and even as we talk, you are in considerable pain and pain killers and yet you are forging ahead continuously, perpetually. You are as if driven. Do you fear death? Please make my body my friend. This body has become most disobedient to my will and then I move. Life and death being twin brothers, I love it immensely. R.M. : Do you believe in life after death?